There is also the option to shop online at the M&S website at www.marksandspencer.com where you can see the latest Marks and Spencers offers like get three and pay for two, discounted prices and free delivery when you spend over �30 - handy on a dreich Aberdeenshire day. 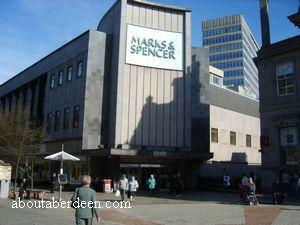 The ladies fashion at Marks and Spencer Aberdeen is located on the ground floor with the latest fashions on display. There are two tills point on this and each floor and each section has 4 tills and staff so queuing is kept to a minimum, even at the height of the Christmas and January sales. One feature of note about Marks and Spencers Aberdeen is that there are chairs scattered around the store for customers to have a seat, for example by the Union Street facing exit there are four comfortable chairs. There are escalators in the shop which reaches all floors. I cannot recall seeing any lifts for wheelchair users or those with children in a buggy or pram but I shall ask a member of staff next time and update this review with this information. More women's clothing and an extensive lingerie section can be found on the first floor at Marks and Spencer Aberdeen with a wide range of bras, underwear and hosiery. Staff are always on hand to help men looking for a romantic gift for the woman in their life. The children's clothing section can also be found on this floor. The school clothing section is fully stocked at the beginning of each school term so that children can be fitted out with school uniforms like shirts, blouses, trousers, skirts, gym wear, shoes and jackets. This narrows down out with term times and the larger stock is devoted to kids fashion and accessories. The second floor of Marks and Spencer Aberdeen has a wide range of men's fashion, suits, shirts and ties as well as casual wear and seasonal clothing like jackets, shorts, t-shirts, etc. The comfortable M&S slippers are always in stock, especially at Christmas which will please most Aberdonian dads looking forward to some comfy home footwear! Brands include the durable but fashionable Blue Harbour brand which is comfortable to wear. Refresh your wardrobe with new arrivals from M&S menswear collections; from essential smart-casual must-haves to the latest smart and sharp, tailored designs. Next to the gentleman's section is a cafeteria and small restaurant and the delicious smell of coffee and fresh cakes wafts through the top floor to entice shoppers for a well deserved rest and refreshment. Toilets in Marks and Spencer Aberdeen are located next to the cafe and are the most spacious loos I've seen in Aberdeen. They are also the cleanest I've seen in the Granite City. There are toileting and bathroom facilities for disabled people and parent and baby or toddler changing rooms. The household section is also on this upper floor with lighting, lamps, cushions, bedding, kitchen items and furniture. Marks and Spencer is conveniently located in the St Nicholas Shopping Centre in Aberdeen, just off the bottom end of Union Street. The nearest car park is the Bon Accord car park, though the Trinity Centre car park is only a short walk away. Shoppers who park in the Bon Accord car park should take the elevator or stairs to the ground floor and walk to the exit past Woolworths, The Bank of Scotland and the Bear Factory. Upon exiting the shopping mall cross the road at the pedestrian crossing and enter the Saint Nicholas Shopping Centre. The left door is automatic and better suited for disabled people, wheelchair users and those with buggies, pushchairs or prams. The other doors are quite heavy and tend to be a bit on the stiff side. M&S is located at the end of the shopping centre on the left, next to the lingerie shop. If you intend to park at the Trinity Centre take the elevator to the Debenhams floor, go past the jewellery shop and head to the exit. Turn right and go down Union Street to the second pedestrian crossing. Marks and Spencer is across the road. Because Marks and Spencer is such a large store there are usually job vacancies within the Aberdeen branch or other UK branches. Other M&S stores in Scotland include Elgin, Glasgow and Edinburgh. There are more job opportunities and a recruitment drive in the months prior to Christmas to cope with the Xmas rush and such jobs can lead to a full time vacancy. It is best to apply August or September to beat the rush and get ahead. Work opportunities at M&S bring their own rewards for all staff from customer assistant, customer services, section managers, a store manager and through to head office employees include 20% discount at Marks and Spencer, a pension scheme and annual bonus along with work perks like 8% off leisure attractions, health club membership and even holidays. Marks and Spencer work with some top UK models and famous faces to demonstrate their range of fashion and accessories. In 2006 the 1960s model Twiggy was the face of M&S. Marks and Spencer also promote themselves on some stunning television adverts, especially Christmas at M&S. The Christmas 2005 M&S television advert featured many Hollywood stars such as Demi Moore. The Marks and Spencer Christmas Advert 2007 was filmed like an old fashioned movie from the 1950s era. It showed Marks and Spencer Christmas fashion worn by models Laura Bailey, Twiggy and Erin O'Connor. To continue the Hollywood theme the Marks and Spencer Christmas ad had a male hero in the form of Zorro actor Antonio Banderas. The 2009 M&S television advert for Christmas starred Stephen Fry, John Sergeant, Joanna Lumley and Jennifer Saunders. The 2006 Christmas M&S advert had a James Bond and Ice Concert theme and the star was Shirley Bassey. It was first aired on 8 November 2006. As you can see in the photograph to the left the stars wore some of the stunning winter range from M&S. The theme tune was Get This Party Started which was sung by Shirley Bassey. Other stars in the 2006 M&S ad were Twiggy, Erin O'Connor, Laura Bailey, Noemie Lenoir and Elizabeth Jagger. The plot of the 90 second television advert saw supermodel Erin O'Connor doing a photo shoot beside London Bridge. She gets a call. At the same time Noemie Lenoir is reading a book at home when she also gets a call. Twiggy also gets a call while she is having a meal. Then three snow-bikes are seen speeding over a snow covered landscape before pulling up by a huge Crystallised building. The first rider pulls her helmet off and it is model Elizabeth Jagger. The other snow bikers take off their helmets to reveal Noemie Lenoir and Erin O'Connor. Twiggy arrives on a sleigh and delivers Christmas gifts. Inside the crystal hotel the models each open Twiggy's presents and are getting ready for the party. As they walk down the staircase to the party the singer is revealed as Shirley Bassey performing her version of Pink's Get This Party Started. Though TV advertising opportunities existed as early as 1955, Marks and Spencer did not Start advertising on the telly until the middle of the 1990s. Prior to this they relied on their reputation of happy customers. M&S started television adverts to highlight to their customers and potential customers of their British made selling policy. The luxurious food range has been advertised by the actress Dervla Kirwan (Ballykissangel, 55 Degrees North, Goodnight Sweetheart) with the tagline "This is not just food, this is M&S food". Marks and Spencer produce a shopping magazine called Your M&S Magazine. The Christmas edition of Your M&S Magazine is now available and is usually published in November. Articles include celebrity fashion and style tips, shopping tips, a Christmas dinner survival kit, gift ideas and how to make Christmas even more special for younger children. Marks and Spencer started as a chain of penny bazaars founded by Michael Marks in Leeds. He was a Russian born Polish-Jewish immigrant who started his bazaars with a loan of just �5 from the wholesaler Issac Dewhirst. By 1894 Michael Marks had opened a proper store at Stretford Road, Hulme, in Manchester. He later met a cashier called Thomas Spencer who worked at Dewhirst and they formed a partnership and so the company Marks and Spencer was formed. The Dewhirst connected continued when that company moved from wholesaling into manufacturing and supplied Marks and Spencer. They remain one of the largest suppliers of Marks and Spencer. The company continued to grow and Marks� son became involved in the family business. With his friend Israel Sieff they made Marks and Spencer into a household name and popular shop. It was soon nicknamed M&S or St Michaels and has other nicknames like Sparkies, Sparks, Markies and Marks. Marks and Spencer expanded throughout the UK opening stores in city�s like Edinburgh, Glasgow, York, Bayswater, Cambridge, Cardiff, Guildford, Ipswich and over 400 more towns and even small villages. They remain one of the top British retailers of clothing and food. The largest Marks and Spencer store is in London at Marble Arch which has over 170,000 square feet of retail floor space. There are over 192 M&S franchised stores overseas including countries like Southern Cyprus, Hong Kong, Jersey, Gibraltar, Kuwait, Malta, Russia and Turkey. In 2006 the annual turnover of Marks and Spencer was �7.71 billion. M&S have about 70,550 employees. Marks and Spencer started as a Penny Bazaar and in 2009 they celebrated their 125th anniversary by returning to their roots and selling items for just 1p. Aberdeen shoppers were able to snap up bargains such as necklaces, tea towels, mugs, sweets, fizzy drinks such as ginger beer, ties, purses and jewellery. Items were restricted to five per person though sold out quickly on each day. The pennies from the proceeds of the penny bazaar were donated to local charities as part of the M&S 125 Charity Challenge. During the 125th M&S birthday celebrations the St Nicholas Aberdeen Marks and Spencer shop decided to raise�1.25 million over 125 days for Aberdeen good causes and charities. These worthy causes include Raeden Special Needs Children's Nursery. Alzheimer Scotland and Chest Heart and Stroke Scotland. The J Cup Bra was launched by Marks and Spencer in November 2007 for the woman in need of a full figure bra. The M&S J cup bra was designed to meet the need of the fuller figured woman for many reasons such as women becoming more aware of their breast size, wearing incorrectly fitted bras and needing a larger size to prevent back ache, neck pain or shoulder pain, bad posture and obesity caused by low exercise and unhealthy diets. Leading doctors have also suggested that a side effect of the contraceptive pill have put weight on the nations women along with better nutrition and cheaper food. Though a generation ago had post war rationing modern women are still not eating a healthily due to the rise in readily available junk food. High fibre and low fat food was easily obtained during the ration period and helped to keep weight down and breast size smaller. At a time before the popularity of the contraceptive pill in the 1950s the average size of a lady was 12. Modern ladies are on average a size 16. The average hip size of a modern lady is 40.5 compared to 39 50 years ago. Women are on average one and a half inches taller than their grandparents. Though owning a car was rare in the 50s and walking or taking public transport and walking between destinations was common, modern women have easier access to cars and exercise far less. Even those women who do not take the pill do not entirely escape its effects because the chemical oestrogen can be traced in the water system and add to the effects of weight gain. It would be easy to suggest that the J cup bra is needed because women are having breast enlargement operations but the reality is that breast reduction ops are more common. For example teenagers who are bullied because of their large breasts or women who are heavily endowed and experiencing chronic back ache are choosing to have a breast reduction operation. Previously the largest bras sold by M&S were a size G cup. The best selling bra cup size is a 36C. Five years ago this was a 34B. One quarter of bras sold by M&S are size DD cup or above and this figure has doubled over three years. In addition to the J-cup bra M&S are also selling GG, H, HH cup bras. Marks and Spencers were the first high street shop and online store to offer the size J cup bras which were first introduced at www.marksandspencer.com before hitting the shops in time for Christmas and the January sales. Women across the UK and in the worldwide M&S branches who require a larger sized bra will no longer have to suffer the pain and indignity of wearing a smaller size nor having to pay over the top prices at specialist bra fitters. Fashion experts and bra sellers recommend women go to an expert bra fitter to ensure they are wearing the correct bra size to prevent pains and bad posture developing whilst ensuring their comfort. Getting a bra size measured is becoming more socially acceptable and has been another factor in the development of a size J cup bra. It is thought that about 75% of women are wearing the wrong bra size. Marks and Spencer Aberdeen offer a bra fitting service on the first floor in the privacy of the fitting rooms by the lingerie section. The staff at Marks and Spencer Aberdeen are also happy to help you choose from their wide selection of bras. On the 15 January 2007 Marks & Spencer announced a five year plan for the company to become carbon neutral. M&S will invest �200 million into this environmentally friendly plan. The M&S eco-plan involves cutting energy consumption, using recyclable and renewable material, buying fair trade products and stopping using landfill sites. M&S also plan to buy more UK and the Republic of Ireland products to sell in the M&S foodhalls. In 2007 they sell about 50% of UK produce and the other 50% has to be flown from abroad so that it arrives fresh in store. Unfortunately this leaves a carbon trail from the consumption of airfuel by the airlines. M&S will concentrate on reducing this and other carbon trails. So as an example there will be produced in the UK stickers on products to help the customer decide what food product to buy. More M&S clothing will now be made from fair trade cotton and polyester clothes will be made from recycled plastic rather than oil. The Chief executive of M&S, Stuart Rose, has assured customers that any costs to implement this carbon neutral environmentally friendly policy will not be passed onto the customer. M&S will cover the costs of tackling climate change and handling waste in an environmentally friendly way. Stuart Rose compared the carbon savings which will be made by Marks&Spencer to be the equivalent of taking 100,000 cars off the road each year. In the same news release M&S announced that their October 2006 to December 2006 period were up 5.6% compared to October 2005 to December 2005 and that their share price has risen steadily for the last 15 months. Former Friends of the Earth director Jonathon Porritt helped to advise M&S on its new environmental policy. On Thursday 29 March 2007 Marks and Spencer opened a Simply Food branch in Westhill, Aberdeen on the site of a former Somerfield store. The 11500sq ft shop sells over 3000 M&S food products, ready meals, snacks, salads, sandwiches, fresh bakery products, fresh fruit and salads, flowers and plants. It also sells wine, champagne, gifts, clothes and beauty products. The ribbon to the shop was cut by manager Andrew Christie to mark the official opening of the Westhill Simply Food branch. Marks and Spencer finance for 2007 were looking healthy with a strong recovery of a 28.5% rise in their annual profits. M&S declared pre-tax profits of �965.2 million. This was a huge increase from 2006 with Marks and Spencer finance pre tax profits of �751.4 million. This was great news for employees of Marks and Spencer Aberdeen and those nationwide who will all share a �91 billion bonus. Marks and Spencer chief executive Stuart Rose recognised the valuable role of their store customer assistants and �26 million have been shared between them. Further M&S news included the announcement that 10,000 Marks and Spencer jobs will be created over the next three years. Stuart Rose himself was rewarded well for his hard work as the boss of Marks and Spencer. He earned a salary and bonuses of �7.8 million for 2006 which was from a cash and shares bonus of �2.6 million with a salary of �1.05 million which was raised from the previous year from �975,000 and the maximum shares bonus of four times his annual salary to bring this to �4.2 million. In January 2008 Marks and Spencer introduced MRSA Silver Pyjamas. These special range of sleepwear consists of pyjamas, slippers and nightdresses that have been designed to help keep down the risk of contamination from the MRSA bug whilst in hospital. The MRSA silver pyjamas contain 2% silver that has been special woven into the fabric. This silver is thought to help fight infections. The M&S MRSA silver pyjamas were on sale just as a trial for January 2008. Marks and Spencer Aberdeen along with UK stores introduced a 75p jam sandwich in February 2008. M&S introduced the jam sandwich as a credit crunch lunch that will give folk comfort as they think it a simple pleasure of life and was a traditional butty like many Scots folk, including Oor Wullie, will have grown up eating - two slices of white bread, butter and jam. The Marks and Spencer jam sandwich is called The Simply...Strawberry Jam Sandwich.